The capability to send SMS campaigns will need to be discussed with your Account Manager and then set up for your use. Once your account has been configured to send SMS campaigns then you can go about building your first SMS campaign. Create a new campaign as you would normally. 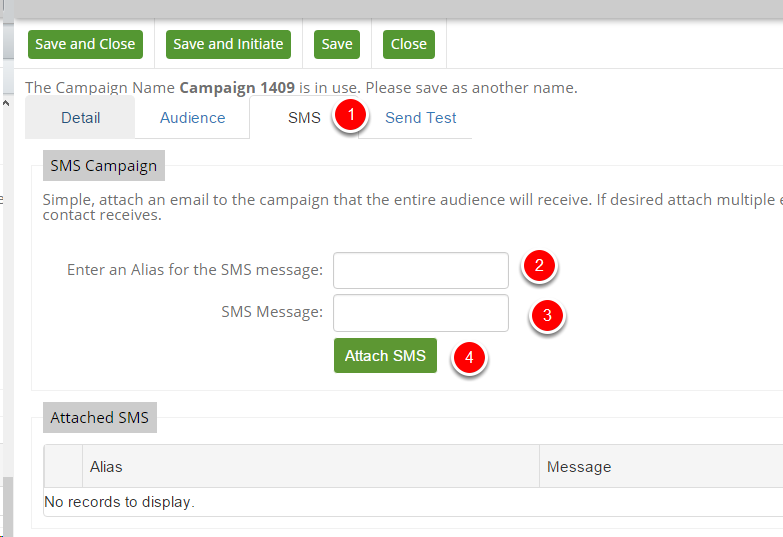 Once you have added a new campaign your will need to convert it to an SMS campaign by select SMS in the type drop down. This will then remove a number of tabs from along the top. Your audience will need to have been uploaded with a mobile number against them, in order for you to be able to send them an SMS. The audience can be counted as you would normally. Click on the SMS tab at the top of the screen. Enter an Alias for the SMS. You can send a test SMS by going to the send test tab, the person you wish to send the test to needs to be in your Communigator database and have a mobile number in the mobile field. Once you are ready to initiate your SMS campaign, this can be done in the same way as normal. It is only possible to report the number of SMS’ that have been sent, it is not possible to show if they have been opened and of course there will be no click throughs.